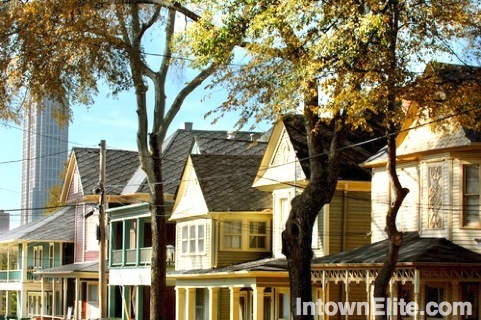 Old 4th Ward is an historic Intown Atlanta community with many Victorian and Craftsman style homes. Recently, some have referred to this area as the "SoNo District", for its location "South of North Avenue", but purists prefer it's historic name, Old Fourth Ward. (Technically, SoNo is west of Old Fourth Ward, between Piedmont and the Connector.) Old Fourth Ward is best known as the place where Martin Luther King, Jr. was born, raised and preached. The neighborhood was also the original home of Morris Brown College and Clark College and later Clark Atlanta University. Old Fourth Ward is located east of Downtown, south of Midtown, and west of Poncey-Highland and Inman Park.